This was the mecca for motorists. But it’s now an ironic hole in the road. This is the intersection of Boren Avenue and Pine Street, looking southeast towards First Hill. The 1950 photo shows the Washington Auto Club’s headquarters. In 1926 they moved into this building, the first dedicated building for the local branch of the American Automobile Association (AAA). It put them in the middle of Seattle’s auto row, which ran up from downtown to Broadway. You might notice that the building shares architectural attributes with the surrounding auto dealerships. That’s because AAA wasn’t the first owner. It was built in 1916 for Roesch Motors, who sold Velie Motor Carriages. If anyone understands the pitfalls of backing autos, it should be AAA. AAA lost out in the automobile’s war on cities in epic, ironic fashion. First, their headquarters and the entire neighborhood here were carved away for Interstate 5. Boren and Pine is now an intersection of raised viaducts. Second, AAA relocated to 303 6th Avenue North in 1958. It was just a few months before the new Broad Street and Mercer Street underpasses opened, paving the way for I-5 traffic in South Lake Union. Little did AAA know that they were moving into the middle of the inaccessible triangle formed by Denny, Aurora, and Broad. AAA found its own solution to the area’s traffic tie-ups. They moved their offices over to Bellevue by the turn of the century, when the freeway system began to completely fail. This article is an expansion of a 2010 article by Rob Ketcherside for a now-zombied local blog. This entry was posted in News, etc. by Robert Ketcherside. Bookmark the permalink. 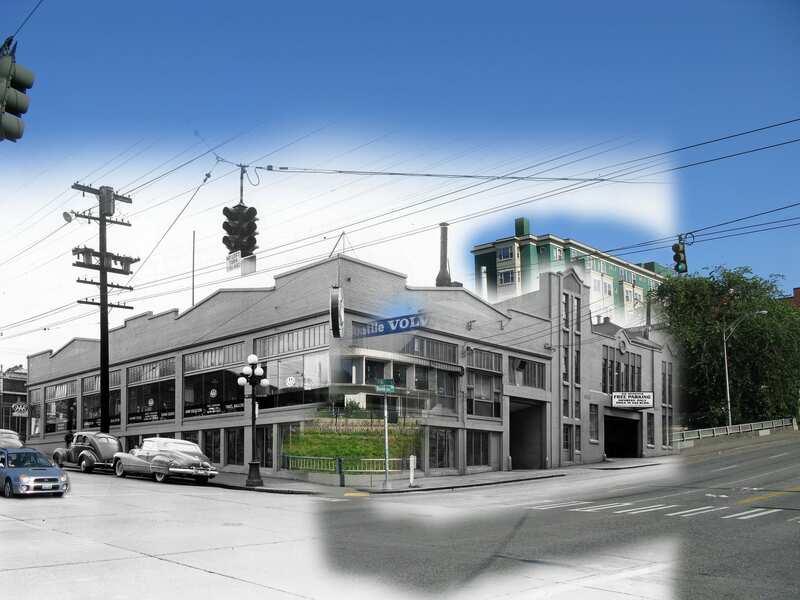 Rob Ketcherside is co-founder of Capitol Hill Historical Society, http://capitolhillpast.com. He has a book, Lost Seattle, available at the library and the Elliott Bay Book Co.